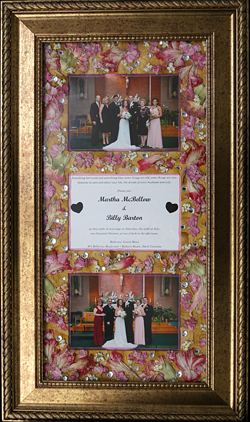 At Petal a Memory, we create beautiful flower mattings from your dried flowers, suitable for framing and displaying your favorite photos and more. 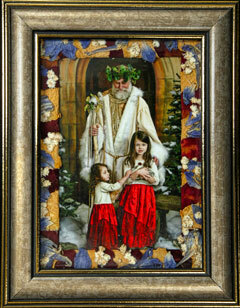 We offer three mat sizes designed to fit into standard photo frames. 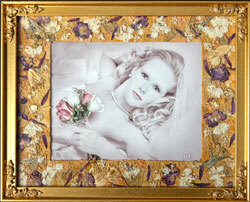 We also can customize orders and create mats for collages or uniquely sized frames. 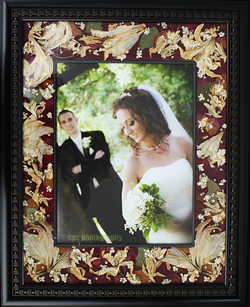 Contact Petal a Memory to find out how we can personalize your order today! Shipping is a flat fee rate of $15 in Pennsylvania and $20 outside of Pennsylvania. Plus Insurance. You may select the shape of the opening for the photo, such as an oval or rectangle. If you do not have sufficient roses for the size of mat you would like, we can add the rest (for a modest additional charge). Do you have some special items you'd like to include? If you supply us with the materials, we can add embellishments to make your mat truly unique. Collages. 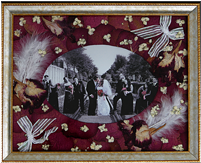 Let us work with you on a truly special design, a collage made to display multiple photos or other keepsakes. 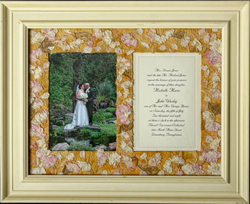 In addition to enhancing the display of photos, our flower mats can be used for invitations, memory cards, birth announcements, graduation announcements, and more. Prices for special orders vary based on your custom needs. Price is determined on day of your complementary consultation or when your order is placed.